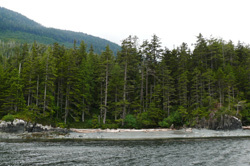 We have developed the camp site over the years to be one of the best camp locations in Johnstone Strait. Careful planning has gone into every aspect of our campsite development. It is important to us to maintain the ecological integrity, and retain the wilderness characteristics of the site, as well as being be visually unobtrusive. 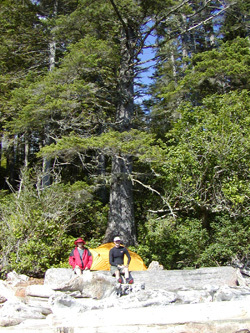 Spyhop Point camp is a unique environment, Sitka spruce, Red cedar and Coastal hemlock tower above the thick Salal ground cover. On the natural plateaus above the beach area we have constructed tent platforms filled with red cedar wood chips to protect the forest floor, and to provide for your comfort. 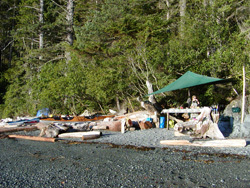 The cook shelter is located just above the beach camp gathering and campfire area. Beach side campfire traces are completely erased every year by the powerful winter storms. 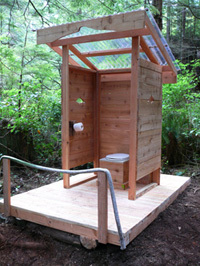 Private outdoor toilet facilities are provided, at the camp. Spyhop Point camp is situated in the core travel area of the northern resident Killer Whales, and within comfortable paddle distance to the protected Robson Bight (Michael Bigg) Ecological Reserve, the world's first Orca Whale sanctuary. From our beach area we look east down Johnstone Strait, and have the advantage of being able to see any approaching whales well in advance of their arrival. From Spy Hop camp we enjoy frequent sightings of Killer Whales, Dall's Porpoise, Seals, Pacific White Sided Dolphins, Sea Lions, River Otters, Bald Eagles, Ravens, and a variety of sea birds. 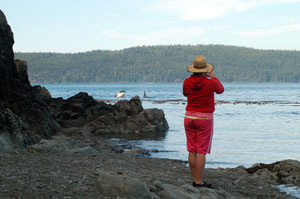 Occasionally Humpback and Minke Whales slip into the Strait, and we have observed them directly in front of the camp! Amazing sunrises are enjoyed in the early morning, and sunsets at the end of the day. Looking north across Johnstone Strait we view the glaciated peaks of British Columbia's coastal mountain range. This image is of Spyhop Beach and our camp. One of our objectives for the camp is to minimize the visual impact. From the water the cook shelter and tent sites are undetectable. 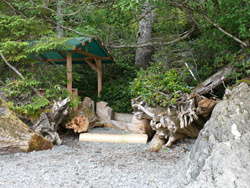 Our wilderness cook shelter (The Spyhop Cafe) is located just off the beach behind the group gathering area. The Spyhop Cafe has been carefully designed and placed to be functional and yet unobtrusive. You'll be enjoying the many culinary delights prepared by your guides. The privy is nestled in the forest area behind our camp. Designed by our guide Kerry Orchard and built entirely of Vancouver Island western red cedar which was milled by one of our neighbours. The view is like no other bathroom facility you have ever visited!